In a medium sauce pot, bring ¾ cup [1½ cups] lightly salted water to a boil with 1½ teaspoons [1 TBL] butter, if using. Stir in the couscous and remove from the heat. Cover and let stand until the couscous is tender and the liquid is absorbed, 6 to 8 minutes. Fluff with a fork and cover to keep warm. While the couscous cooks, prepare the meatballs. Cut a small corner from the ground lamb packages and drain off any excess liquid. Transfer to a plate; pat dry with a paper towel. In a large bowl, combine the ground lamb and baharat, season generously with salt and pepper, and mix until just combined. Using wet hands, form the mixture into 1-inch meatballs. In a large frying pan [large sauce pot] over medium-high heat, warm 2 to 3 teaspoons oil until hot but not smoking. Working in batches if needed, add the meatballs and cook, turning once, until lightly browned but not yet cooked through, 2 to 3 minutes per side. Transfer to a plate. Add more oil between batches if needed. Do not clean the pan. While the meatballs brown, prepare the vegetables. Peel and coarsely chop enough onion to measure 1 cup [2 cups]. Cut the artichoke hearts in half lengthwise. Strip the parsley leaves from the stems; coarsely chop the leaves for garnish. In the same pan [pot] used for the meatballs, if dry, add 1 to 2 teaspoons oil. Warm over medium-high heat until hot but not smoking. Add the onion, season with salt and pepper, and cook, stirring occasionally, until starting to soften, 2 to 3 minutes. Stir in the tagine spice blend and cook until fragrant, about 30 seconds. Add the tomato sauce base and 1½ cups [2½ cups] water, season with salt and pepper, and bring to a boil. Reduce to a simmer and cook, stirring occasionally, until the sauce is thickened slightly, 5 to 7 minutes. Add the artichokes and meatballs. With the back of a spoon, form 2  wells in the sauce and crack an egg into each well. Cover and cook until the whites have set, the yolks are slightly runny, and the meatballs are cooked through, 3 to 5 minutes. If you prefer firmer yolks, cook for 1 to 2 minutes longer. Remove from the heat and season to taste with salt and pepper. Transfer the couscous to individual bowls and top with the lamb tagine and eggs. Garnish with the parsley and serve. Measure the water for the couscous. 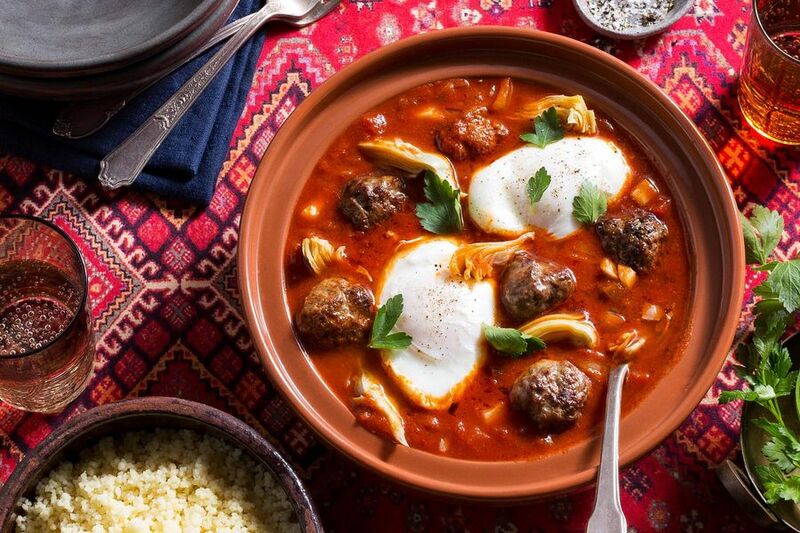 Known as kefta mkaouara, this Moroccan-inspired tagine of lamb meatballs and poached eggs simmered in tomato sauce makes a richly spiced, flavorful dish fun and accessible. Before shaping and cooking the meatballs, you can test the seasoning of the meat mixture by cooking a tablespoon or so in a small frying pan with a bit of oil over medium-high heat on the stovetop. Baharat, the Arabic word for “spices,” is a blend that typically includes coriander, cumin, black pepper, and cardamom. It’s commonly used in Middle Eastern cooking for everything from roasted meats and stews to salads and marinades. Calories: 630, Protein: 43g (86% DV), Fiber: 11g (44% DV), Total Fat: 22g (34% DV), Monounsaturated Fat: 11g, Polyunsaturated Fat: 2.5g, Saturated Fat: 7g (35% DV), Cholesterol: 225mg (75% DV), Sodium: 330mg (14% DV), Carbohydrates: 64g (21% DV), Total Sugars: 10g, Added Sugars: 0g (0% DV).